Hi everyone! 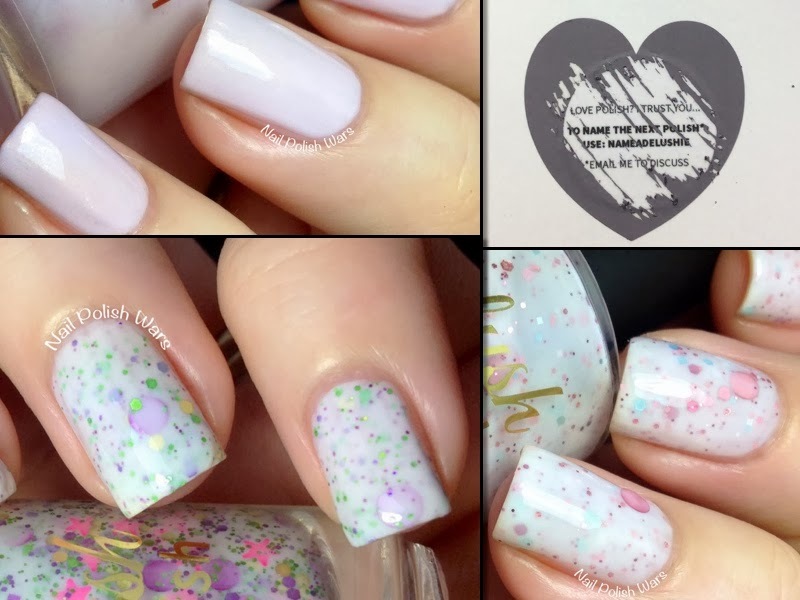 It always makes me so excited to have the chance to try out an indie brand for the first time, so I jumped at the chance to review the Valentine's Day 2014 Collection from Delush Polish. Je Ne Sais Quoi is a soft white crelly, with a hint of a lilac undertone, loaded with multi-sized hexes and squares in rose metallic and grey satin. The formula was smooth and easy to apply. I absolutely LOVE this shade! I'm crazy about how delicate it looks! Shown is three coats of Je Ne Sais Quoi. Love Me Lights Out is a crisp white crelly loaded with multi-sized hexes, dots, and stars in hot pink, fuchsia, purple, green, and gold. The formula was smooth and easy to apply, but it is a little more on the opaque side for a crelly - so it's a little easy for the undercoat glitters to hide. You might notice a distinct lack of pink stars on my nails. Unfortunately, I had a lot of trouble getting any of them to come out of the bottle. Delush is adding more stars to the batches of this though, so it should be easier for you. I like this one a lot! It kind of gave me a romantic Mardi Gras feel - which is a description I never thought I'd be able to use! Shown is three coats of Love Me Lights Out. Make Me Blush is a very soft baby pink creme with a subtle shimmer. The formula was easy to apply, but was a tiny bit streaky during the first two coats. The third coat balanced it out perfectly though. I don't think I have any pinks that are this pale, so of course I immediately adored it! Shown is three coats of Make Me Blush. 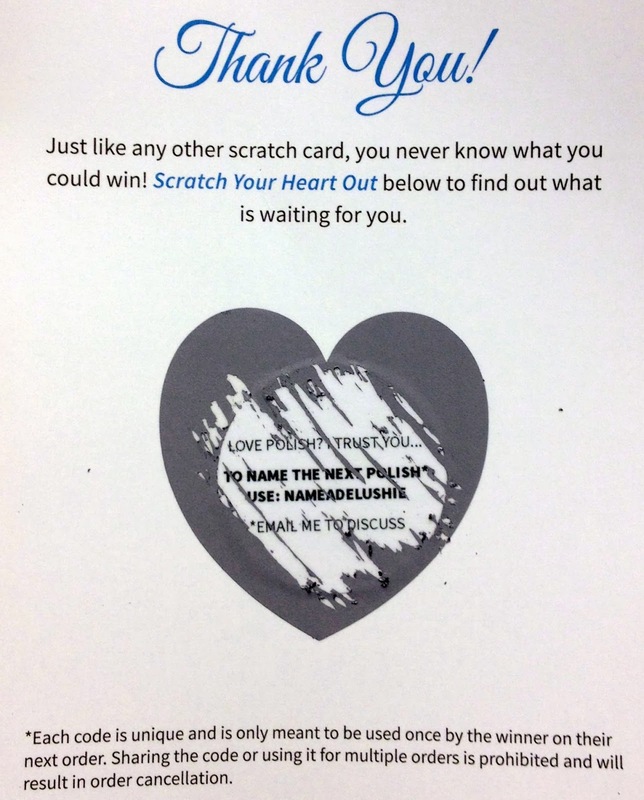 Delush Polish orders also come with these awesome scratch off cards! I freaking love this idea!!! I was so stoked to scratch mine off, and then even more excited to see that I get to name a Delush shade! How fab is that?! I think it's safe to say that my first experience with Delush Polish was a great one! You can find these and other great Delush Polish shades at their storefront here, and be sure to check them out on Facebook for all of their latest updates and collections! I love these! They look fab on you - so soft and pretty, but the glitters are super fun! That's so cool that you get to name a polish! 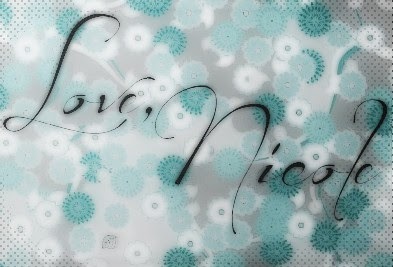 I love Je Ne Sais Quoi! I so like hearing about new indie polishes. This looks like a good beginning for the company. Nice polishes - I especially like Je Ne Sais Quoi, even if I would pick off the large glitter (which I don't like).